Learn simple steps for growing edibles in containers! You don’t need big acreage to grow your own food and enjoy it. 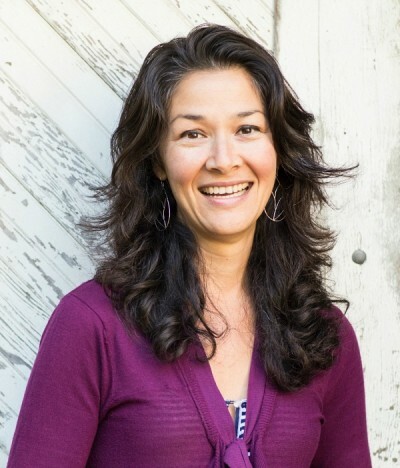 In this episode, I interview Julie Chai – the former Senior Editor for Gardening at Sunset Magazine. We chat about all the must-know elements to successful container gardening. Or just check out the full transcript below. 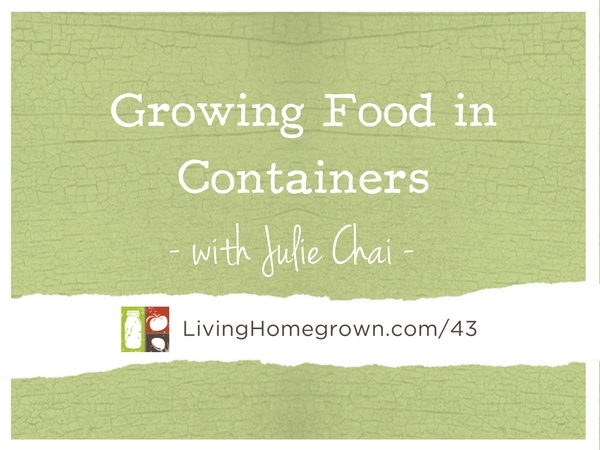 Julie really knows her stuff when it comes to small space garden design and growing food. As one of the Senior Editors at Sunset Magazine, Julie worked on garden related stories for every season and every growing condition. But she has a special place in her heart for people with little to no garden space. With just a container, some potting soil and some sunshine, you can reap a harvest in a tiny space. These show notes summarize the tips Julie gave for doing just that. The best containers to use are glazed clay containers or those made from a synthetic material that is non-porous. Terracotta pots are not a great choice as they will lose moisture too quickly and your plants might dry out too fast. If you have your heart set on terra cotta, you can apply a sealer to the inside and outside (just do a small test area first to ensure you are okay with the sheen). No matter what container you select it’s really, really important to ensure your containers have drainage holes. You don’t want excess water pooling up in the bottom of your pots because that can start to create root rot which will destroy your crop. If you can, pick pots that are 16” long and 16” deep or larger. Look for an organic potting soil that has lots of amendments. Typically you get what you pay for. The cheapest product may not be the best choice. You do NOT want to use regular garden soil because may introduce bugs or disease into the pot. And unlike the ground, your container is an enclosed space and those bugs will have nothing else to do but munch on your plantings! It’s not a problem you can fix easily, so stick to purchasing potting soil. The thing about growing edibles in containers is that you’re going to need to feed – meaning fertilize – them more often than you might for some plants in the ground. This is because there are limited nutrients that are in the soil. When you water some drains out the bottom and as it drains out the bottom you’re always draining nutrients. You can use a diluted liquid organic fertilizer like Dr. Earth. There is no magical water schedule that is one-size-fits-all as it depends on the weather and where you live. The best rule of thumb is to water when the top 20% of the soil is dry. Stick your finger in the soil and get to know how frequently your soil dries out. And the moisture level you’re going for is for the soil to feel as wet as a wrung out sponge. So just damp and lightly moist. You don’t want it soggy or very heavy. For most edibles you want at least six hours of sun per day. Greens or herbs can get by on less. Very few people have the perfect sun exposure that will give the ideal amount of sun per day. Just do your best and if need be you can always move your container around to a sunnier spot. That’s one of the perks of container gardening! Choose the sunniest spot you have. To give yourself the best chance for success, start with small plants or seedlings. They are really easy. They’re already started so they are a great place to start. Nurseries also tend to have a really great selection. Seed starting is also quite easy but there are a lot more variables to pay attention to so for greatest ease start with seedlings. You can grow almost anything in containers if you have a big enough container. The only exception would be some fruit trees that grow really big so you don’t want to put those in a container (unless they are a dwarf variety). Good choices for getting started are crops like peppers and tomatoes and lettuces and all the leafy greens like kale and Swiss chard. When we’re talking about edibles pretty much anything goes! For beginners plant something that’s a sure thing so you can reap the rewards and get excited about container gardening! I started a bucket garden as part of a research project and utilized the orange 5 gallon buckets from the local diy store which were less than $3/each. Drilled holes in the bottom and filled with potting soil and starter plants from my nursery and had great success. Since this time, I have located white buckets for a similar low cost which really makes container gardening affordable for all. Very cool Andrea. I’m loving all these bucket ideas! First of all congratulations on winning The Taste Award for Best Food or Drink Broadcast of 2015. Now when I brag about listening to your podcast I can give myself and you more credibility by adding award winning, as well. I have gardened in pots (containers) for years. I began using garden soil as that was what was handy. I went to potting soil because garden soil was too heavy and one of the benefits of containers is to be able to move them around when needed. I did get better results, too, with potting soil. I also like to use the 5 gallon buckets you can buy for a few dollars at home improvement stores. You can decorate them if you want (by painting designs of your choice on the sides) and all you need to do is drill some holes in the bottom for drainage. I also like to use stones or tera cota chips over the holes so the water can drain but the soil not so much. Last year due to illness 5 large pots were all that I could handle, but the tomatoes, and peppers made it very worth while. Easy to weed as you don’t need to bend over as much, either. You can also mulch to limit weeds and retain moisture, which I am sure you know already. I use the nearly worthless tomato rings and as the plant reaches the top I drive stakes at the outer edge of the pot and fasten them to the rings and the plant. This year I throw caution to the wind (as far as my health is concerned) and I plant to use the largest containers of all, which you may call “raised beds”. You ladies did a great job. Keep up the great work, Theresa! Thanks Craig! Great tips on the buckets. Theresa, I completely agree that your award was very well deserved to say the least! Also, the podcast was wonderful! Great job by you both sharing your expertise. I listened to it several times to ensure I didn’t miss anything and it gave me something nice to listen to while commuting so I could think about my garden plans for the weekend! For container gardening lovers, I wanted to share a nursery I frequently visit has an area set aside behind their nursery for people to drop off their pots and share with other gardeners. We also have a community email for our zip code that we share items such as used containers or asking for cuttings and transplants on occasion. I love to go pick them up and reuse them after a careful disinfecting and scrubbing. It saved me lots of money and I have lots of different sized pots to container garden with now – as well as a lot of seeds after seeing photos of your garden Theresa! Fingers are crossed I can even begin to replicate a cottage garden. Many thanks for sharing your talents and those of your colleagues. Awesome Laura – what a great idea for sharing pots at the nursery. I wish my local nursery did that. I might have to suggest it. And thank you for the compliments on the podcast. I’m really glad you are enjoying them so much.